We’ve recently looked at several houses on West Hastings (when it was called Seaton) but most of the West End was once residential in character, including West Georgia (which today is a major traffic arterial, but until the arrival of the Lion’s Gate Bridge was a dead end to Stanley Park). Indeed, that residential character continued for a surprisingly long time: this is a 1948 picture of a much older house. There’s another picture of the house, still standing in 1956. When it was photographed it was 1259 W Georgia, but when it was built it was numbered as 1219. It’s identified in the Archives as R W Gordon’s house, and while that description isn’t wrong, the Scottish Mr Gordon wasn’t responsible for building it – that looks like it was the (probably) Welsh Owen Evan-Thomas. It was most likely built in 1891: Owen Grant Evan Thomas (recorded as English in the census that year, although we’re not sure we believe that given the Welsh name, his children’s names and the fact that he died in Wales in 1942), his wife Bessie and their newborn son Elystan were living here. (Five years later another son was born, Glodrydd – a Welsh prince, Elystan Glodrydd is said to have founded the fifth royal tribe of Wales, and died in 1010). Owen Evan-Thomas was an insurance agent with Wulffsohn & Bewicke, Anglo-German bankers and financial agents. His name appears many times in the Vancouver newspapers as an amateur actor and a talented singer. He organized a number of shows, leasing the Opera House for the proceedings. By 1894 he was described as manager and leasee of the Opera House, booking touring shows (and a 1923 memoire recalled his management as very successful, citing his former involvement with Italian opera at Covent Garden). In 1891 he also played cricket in a team that included architect R McKay Fripp, although we don’t know if Fripp had anything to do with the design of the home. In 1896 it was announced that Mr O G Evan-Thomas was moving to England “where It Is understood he will enter upon a professional career on the stage.” We don’t know how successful he was, although in March 1896 the paper noted “O. G. Evan – Thomas, who Is at present In England, will return to New York in January to fill a six months’ engagement with the Carleton Opera Co., playing only in the large cities of the East.” By 1902 thee family were living in Kensington. We haven’t found out what happened to Bessie, but Mr Evan-Thomas appears to have married at least twice more, in 1914 and in 1922. Robert William Gordon and his family were first shown living on West Georgia in 1898. The family had several prominent citizens for neighbours: two barristers, George DeWolf, a broker, and four doors down Baron de St Laurent, the French consul. In 1900 R W Gordon’s occupation was rather unusually being spelled out as “none”. He arrived in Canada in 1886 (aged about 42), having been born in Moffat in Scotland and a year later was Manager of the Vancouver San Juan Lime Co. Francis Carter-Cotton was born in Yorkshire and also arrived in Vancouver in 1886 (aged 40). At the time, Vancouver had two newspapers the Daily News and the Daily Advertiser. Carter-Cotton partnered with R W Gordon to purchase both and founded the Daily News-Advertiser in 1887. (Gordon ran the business; Carter Cotton edited). Cotton was also secretary of the Lime Co; Gordon was President and Manager. The lime was burned at the works on Carrall Street, and was mined in the San Juan Islands. The case seems to have concerned Mr Cotton’s pretending he knew nothing about some debts he had assumed, that Mr Gordon was then liable for. The case became quite complex, and ended up with an order to imprison Mr Cotton for refusing to answer ‘certain questions’. The court (or Mr Justice Walkem, at least) obviously thought more of Mr Gordon’s case than Mr Cotton’s silence, as he committed Cotton to jail. That was, as would be expected, appealed. Five years later similar accusations were leveled at Mr Cotton again – but this time he was in Government rather than a mere newspaper editor, so the consequences were greater. In the 1890s R W Gordon was shown living on the 600 block of Richards Street. In 1896 R W Gordon junior was a clerk with the Telephone Co, and lived at home. By 1901 the census shows Robert William Gordon, aged 57 (although 58 if his death notice is to be believed) in the West Georgia house with his younger wife Julia (formerly Julia Ann Gardner) who had arrived in Canada in 1893, and six children, five from an earlier marriage to Esther Gibson aged between 17 and 28, including Jessie and Ann Mary, and six-year-old Dorothy (Julia’s child). Robert and Esther had married in Traquair, Peebles, Scotland in 1871. Jessie, who died in 1951, was born in Dumfries. The school’s history tells us that Crofton House School was founded here in 1898 by the Gordon sisters, Miss Jessie Gordon and Miss Mary Gordon, in their father’s home on Georgia Street with just four girls. Three years later, in 1901, the school moved to the corner of Jervis and Nelson in the West End. Mr Gordon was the developer of the new school building, as we have him requesting a new street lamp outside (as young ladies would be attending classes in the evening). While we’ve often noted that the 1911 census was often patchy in its coverage, for Robert Gordon it may be justified. While the 1911 street directory shows him resident at the West Georgia address, by 1912 he had gone. There’s less excuse for missing Jessie, who was still running Crofton House School on Jervis for many years after the census. We’re not quite sure where Robert had gone; (he doesn’t seem to feature in any newspaper cuttings after 1911, but his death (in Vancouver) wasn’t recorded until 1928 when he was aged 84, and widowed (Julia having died in 1918). 1259 West Georgia today is part of a private open space associated with a condo tower called Venus, designed by Howard Bingham Hill and completed in 1999. Here’s another example of Chinatown’s subtle change. The 1981 image shows two buildings from the 1970s, using a ‘Chinese’ style of architecture with glazed clay tiles that were never a feature of any of the heritage buildings in the area. The taller building to the east was designed with recessed balconies that pick up some references to the older buildings in the area, and was designed by Urban Design Group Architects and completed in 1978. The balconies were originally only found on the Association buildings and were wrongly assumed to be a general design character to be encouraged in new buildings to ensure the “Chinese character” of the area. The uses show how Chinatown has changed – this started life as a branch of the Royal Bank, the name over the door today is for Ng Fung Enterprises, food suppliers who used to operate a Chinese food store here but today it’s actually a warehouse space for some of the low-cost Chinese clothing establishments in the area, with the store front replaced with a shutter door. Next door in 1981 was Tai Hing, an import-export company (mostly selling food), and 34 years later they’re still in business at the same location. That can’t be said for the Sam Lock restaurant upstairs; today it’s a vacant space looking for a tenant, having changed names several times since Sam Lock closed its doors. Here’s another image showing how little some parts of the city have changed in over 50 years. Our ‘before’ picture was taken in 1961; the ‘after’ on New Years Day 2015. While the buildings haven’t necessarily changed much, the use they’re put to isn’t necessarily the same. The Ford building on the immediate right of the picture became low-cost rental housing in 1985, having been developed as an office building called the Dawson Building, built by Bedford Davidson. On the extreme left of the frame is the Carnegie Library which the sign shows was still the City’s Museum in the early 1960s. Heading west down East Hastings the first tall building is the Maple Hotel – looking really good in both pictures for a building dating from 1912 (designed by Parr McKenzie and Day for James Borland). In between the two pictures the building lost its cornice as our earlier post showed, but now a BC Housing restoration has given the entire building a new lease of life. The two low buildings to the west are from 1904 and 1912; the second by Parr and Fee, who also designed the Balmoral Hotel next door for J K Sutherland, also in 1912. Beyond that are two small buildings dating from 1919 and 1920. The three-storey building beyond that is identified on the insurance maps as the ‘Crowe and Wilson Building’. We’ve looked at its history (and the buildings beyond) when we saw the same block looking east from Columbia Street. Today it’s home to Insite and Onsite, but it was a rooming house called the West Inn in 1961, having changed from the Western Sporting Club when a police raid closed down an extensive gambling operation. The ‘W’ of Woodwards can be seen in both pictures – today it’s a new sign is a slightly different location. Seaton Street was the name that the part of Hastings west of Burrard was known by in its early years. Here’s the home of Stephen Osborne Richards, right across from the Nicolls family home that we posted recently. Mr Richards house was here earlier than the Nicolls house – here it is in 1893, when we think it was newly completed. We haven’t found an architect for the house: W T Dalton designed a commercial block for a Mr Richards in 1896 (one of his earliest commissions), but he was working for C O Wickenden from 1891. If we had to guess we would suggest it was Dalton, working for Wickenden who designed the house: Wickenden designed an office building for F C Innes, Mr Richards business partner. There was another Stephen Richards in Vancouver for a while; in 1913 his widow was still alive, so Stephen’s biography was included with her entry in ‘Northern Who’s Who’. “The late Stephen Richards was born Brockville, Ont., and practiced profession in Toronto thirty years before coming to British Columbia, settling first at Victoria, and then at Vancouver, where he died, 1896. He was a Queen’s Council; a specialist in jurisprudence; an acting judge; and Liberal.” The biography isn’t completely accurate, as Stephen’s death was reported in 1894, and it wasn’t in Vancouver – he was waiting for a ferry on Centre Island in Ontario when he died, aged 75. His widow, Susan, was American (from Buffalo, New York) and their son also became a judge, in Winnipeg. Stephen Richards was one of three brothers born in Brockville; their father was originally a blacksmith, born in Burlington, New York. Each of the three brothers became lawyers, and later politicians and all three at some point held cabinet office. The third and eldest brother was Sir William Buell Richards, the first chief Justice of the Supreme Court of Canada. He had three sons and two daughters: one son was S O Richards – almost certainly Stephen Osborne Richards. No doubt he used his middle initial to distinguish himself from his uncle. Stephen O Richards was apparently here before the 1886 fire, but apparently purchased no property, and wasn’t on the Voter’s list. In 1887 he was working as a barrister for Courbold and McColl. By 1889 he was a partner in Innes and Richards, land agents, and living (appropriately) on Richards Street. F C Innes was another Ontario migrant who was one of the most active real estate promoters (and developers) in the city. In 1891 Stephen O Richards was a lodger with an American couple, Joseph and Celia Lambert, (who lived on Granville) and was listed in the census as a lawyer. In 1892 he was in rooms on Pender Street. By 1894 he was shown living on Seaton Street, as were Miss M L Richards and Miss S C Richards. In 1896 the company had become Innes, Richards and Ackroyd. In the 1901 census he was listed as a land agent, and lived with his sister, Mary, his aunt, Susan, and their domestic, Ah Wong. Neither Susan or Mary’s age is identified. By 1905 the company was Richards and Ackroyd, and while Miss M L Richards was still living on Seaton, Mrs S Richards was living on Robson with Miss S C Richards. 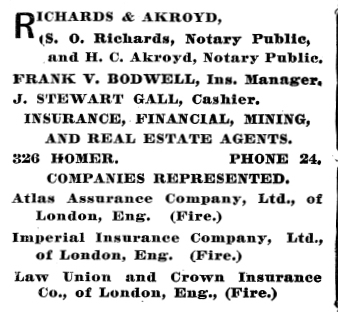 The last time Stephen O Richards appears in a street directory is in 1909, when another partner had been added to become Richards, Ackroyd and Gall. He died in 1910, although we haven’t been able to find details surrounding his death. We think that Stephen O Richards’ aunt, Susan, was the widow of Stephen Richards, the judge. In 1911 she was still living in Vancouver at 1951 Robson Street, aged 87, with her 34 year-old daughter, also called Susan, and her son-in-law, William Robertson. William and Susan had married in Vancouver in 1907. Today the front gate to the Richards house has been replaced by the entrance to the Renaissance Hotel, designed by Waisman Architectural group and completed in 1975. This image is listed as “Exterior of the John P. Nicoll’s residence – 1120 Seaton (Hastings) Street: 1895” The 1895 Directory says J P Nicolls, a clerk working for John J Banfield (an Alderman, and a ‘general and financial agent’) and Edward Nicolls, a solicitor, were both resident. They had both been in the city since 1891, living at a house on Hornby (where John was shown having rooms in Edward’s house). They were from Cornwall; originally a town called Callington, although Edward had practiced in Plymouth before heading to Canada. The last time Edward is mentioned in a street directory is 1900-01; we thought at first they might be brothers, but some digging revealed that Edward was born in 1831, married Anne Pethybridge, and his son, John Pethybridge Nicolls was born in 1871. So this was more likely to have initially been Edward’s house, and became J P’s after Edward Nicolls died in September 1901, aged 69. We haven’t identified an architect, and it may have been designed by the builder as it’s a reasonably modest house. In the 1901 census John is aged 31, head of the household; his mother, Anna and two older unmarried sisters, Margaret and Mary are also at home. Both his mother and Mary were listed as music teachers in the street directory. They’re still together, all aged 10 years more, in the 1911 census, now with the help of a servant. Margaret, who had been the organist at St Andrew’s Wesley, left for California in 1902, but another sister, Elizabeth Hawley had moved in. In 1898 C H Macaulay and J P Nicolls teamed up as Macaulay & Nicolls, insurance and real estate agents, registered in BC and J P Nicolls opened bank account #8 with the Royal Bank of Canada for the firm. In 1900 their offices were at 611 West Hastings. In 1922 Ronald Maitland, who joined the firm as a clerk in 1904, becames a partner and the firm became Macaulay Nicolls Maitland. Charles Maitland died in 1932 and J P Nicolls became the firm’s second president. In 1948 John’s son, J P R Nicolls, joined the firm at age 21. J P Nicolls was elected to office in several of the city’s business organisations, including the first President of the Building Owners and Managers Association of British Columbia. At some point he was engaged to Ethel Wilson, a noted Vancouver author, but she called the engagement off. In 1919 he had a new house built at Drummond Drive. In 1923 he married Gladys Ranking, daughter of the impressively named Devey Fearon de L’Hoste Ranking, in London, and she moved to Canada with him. Gladys was 20 years younger than her husband, 33 to his 53 when they were married. John Pethybridge Nicolls died in 1957, aged 87, and Gladys in 1971. The company he founded continued to expand. By the end of 1978 they had 11 offices and 360 employees in Canada and the U.S., headquartered in 200 Granville Street. In 1985 they merged with Colliers, becoming Colliers Macaulay Nicolls, now known as Colliers International Canada, still based in the Granville Street location but with 1,400 employees across the country, linked to nearly 16,000 around the world. Today the spot where the house stood is the backside of a modest (by contemporary standards) 7-storey office called the Shorehill Building, designed by McCarter, Nairne & Partners and completed in 1966. By 1977 it was the ‘Argyll House residential hotel’ and David Gordon’s shoe store (seen in out 1978 image, below) were in the space that the Black and White Hat Store occupied between 1916 and 1935 – (before that they were a bit further along Hastings). The store occupied the corner of the main floor, Kirkham’s Groceteria (No. 18) was next door, the rooms were The Central Rooms, and A M Lowe ran the dental practice. The Vancouver Public Library image above from 1923 shows the Black and White Hat Store; below our 1970s show it when David Gordon’s shoestore occupied the corner. The ‘Description of Historic Place’ will tell you that this was the home of Charley Dunn & Company, tailors who would later open a series of successful retail outlets which continue to this day. That’s entirely incorrect – Dunn’s were located two blocks west and on the other side of the street! The description does accurately report that ‘In 1907, the building became the home of the Bismarck Café, one of Vancouver’s elite dining establishments. The Café once had ‘a full orchestra, seating for 115 people, eight private dining rooms and an electric fountain.’ Upstairs were the St Ermin Apartments run by Wesley W Shaw (along with William Moody’s dental practice), and J A Coldwell had the corner spot, selling real estate. In 1912 it is identified as the ‘Santa Rosa’ on the insurance map, as the apartments had become known as the Santa Rosa Rooms. It was the home of Owl Drugs for sixty years; they had the main retail floor ‘modernized’ in the 1940s, although the specifications called for the use of the original plate glass wherever possible. For a number of years it’s been closed, and in poor condition, but the owners have recently completed a comprehensive restoration with the rooms upstairs being reoccupied and new restaurants moving into the retail spaces. This picture probably dates from 1926 when ‘The Golden Strain’ was playing, a silent movie directed by Victor Schertzinger. It was a western starring Hobart Bosworth, Kenneth Harlan, Madge Bellamy and Lawford Davidson, based on a novel by Peter B Kynes. That year the theatre was operated by Robert J Dawson, but it had a series of managers over the years including Harry Bell in 1921 (when Mr Dawson was managing the Kitsilano Theatre). Before that, from 1914 to 1920 William Brown was running the theatre for the Lipsin brothers (Abraham and Hyman) who were the owners. In 1913 William Hansher was shown as owning the theatre and Hyman Lipson (sic) managing it, but there’s also a building permit issued that year to William Kilroy and Frederick W Morgan (who also owned the Bayview Hotel down the street) to add two floors of commercial space, or apartments – a plan that was never built. In 1912 William Brown was managing the theatre for Thomas Carroll (who owned it from 1908, and presumably developed the theatre) Carroll was an Englishman, aged 46 in 1911 and living with his wife Mary. He may have also owned the Maple Leaf boarding house at 1327 Granville Street. In 1909 and 1910 John Muir was listed as the proprietor (in other words, the manager – in 1909 he was also running the Rose Theatre, another movie house, at 126 E Hastings). That was probably when the Quann Brothers were owners – they also owned the Rose, the Majestic and several of the city’s hotels. It’s ironic that the film showing in 1926 was silent, as the Maple Leaf had one of two rival ‘talking picture’ systems installed very soon after it opened – the French developed Chronophone system that had two gramophones amplified by compressed air. It was supposedly the first time the system had been installed in Canada. An operator was expected to switch records while trying to match the recording to the action on the screen, (which would have been almost impossible to achieve) and the system had other problems as well – particularly in filling a 500 seat theatre with sound from a gramophone. The system was removed for a while, then reinstalled – but it seems to have gone by the spring of 1909. (More detail at pasttense). The theatre also had an organ, and the first Unitarian service was believed to have been held at the Theatre in early 1909. It has been suggested that the theatre opened with 500 kitchen chairs, but by 1913 it was advertising it’s fine seating, and had 693 seats. The Plaza theatre a 924 seat Odeon house replaced the Maple Leaf in 1937. We found the image of the Maple Leaf on the cinemaplace website.